Just a little greeting from our Village (The East One) to yours, on this the second night of Hannukkah. 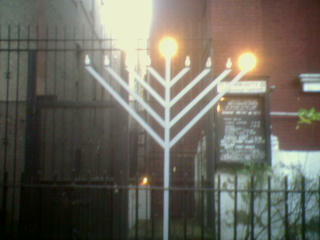 Or Chanuka. Or how ever you spell it. (We like to fit as many n's and k's in there as possible.) It's the holiday with a million spellings, yay! CC's planning to have a festive dinner of latkes at Veselka tonight, with extra applesauce.